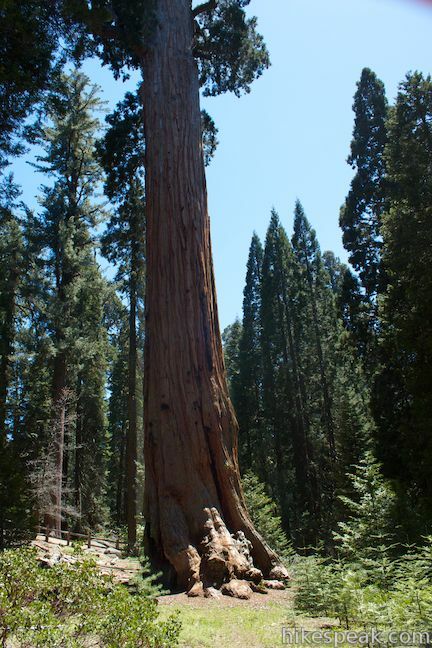 The Grant Grove is one of the top draws in Kings Canyon National Park, containing the park’s most important sequoia, the General Grant Tree. 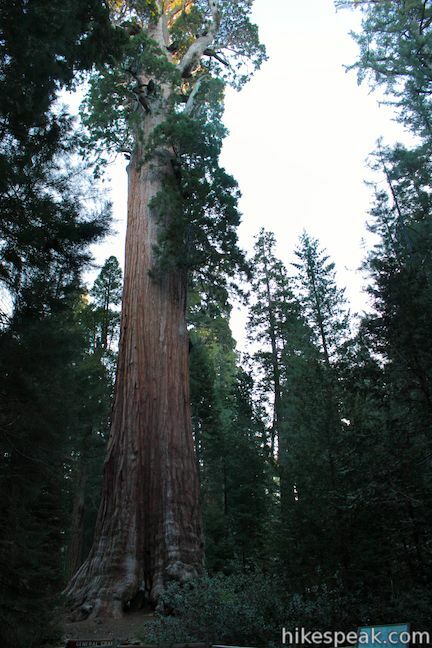 The Grant Grove is one of the world’s premier sequoia habitats with several of the world’s largest trees. 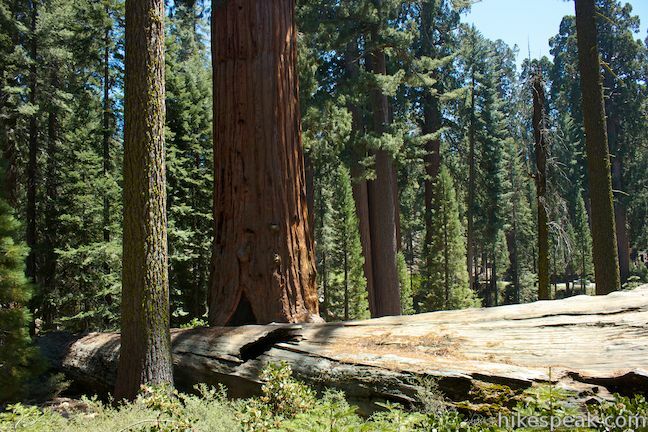 It is the oldest section of Kings Canyon National Park, first protected as General Grant National Park in 1890. 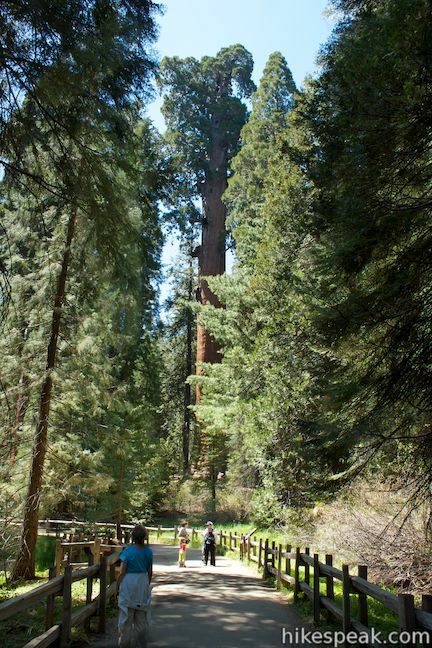 A paved 0.8-mile loop explores the grove of giant sequoias around the General Grant Tree and you can extend your hike in this area by checking out North Boundary Trail, North Grove Trail, and Dead Giant Loop Trail, or by following the trail between Grant Grove and Grant Village. 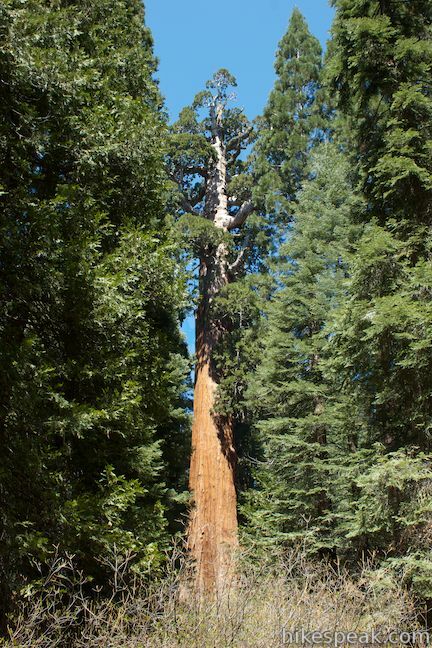 Expect General Grant Tree Trail (the loop through the heart of the Grant Grove) to be filled with other hikers, informative panels, and astonishing trees. 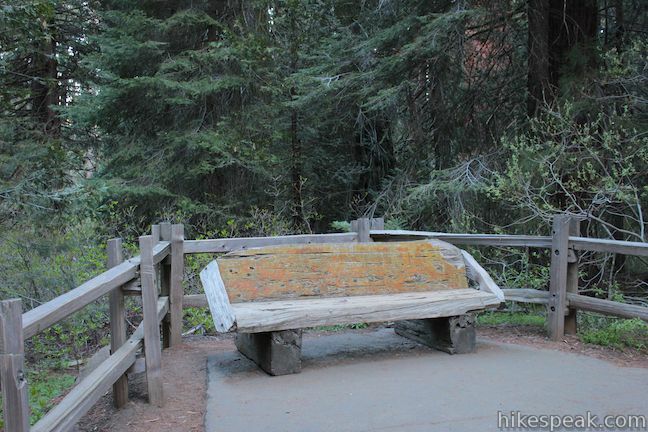 For $1.50 (as of 2013), you can purchase a handy trail guide at the trailhead that was put together by the Sequoia Natural History Association and includes 15 entries that correspond with numbered markers along the trail. 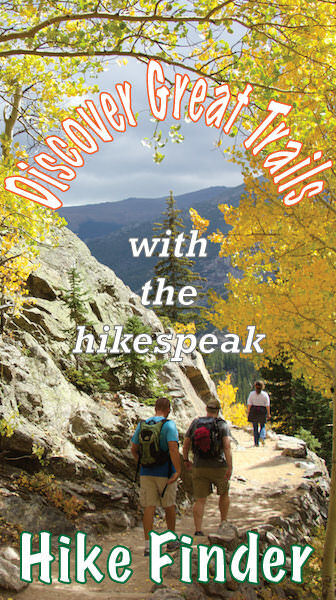 Even without the pamphlet, you will have no trouble making your way to the General Grant Tree, and the panels along the trail provide an adequate amount of information for those who prefer not to read too much while they hike. 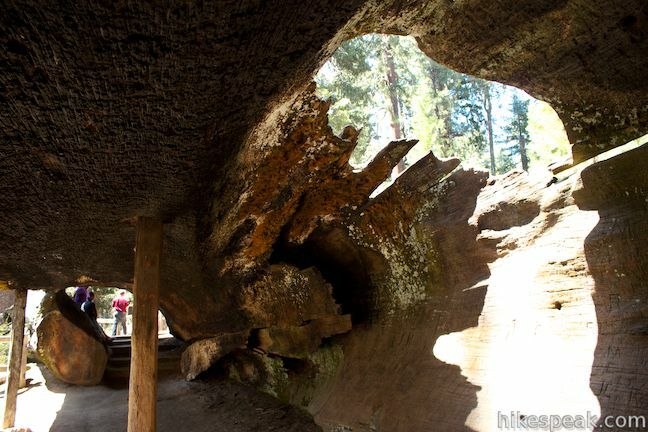 There is a fallen giant sequoia along the trail called the Fallen Goliath that you can walk through to connect the upper and lower sides of the loop. It is so fun to walk through the tree, why not do it twice and convert the short loop into a figure 8? 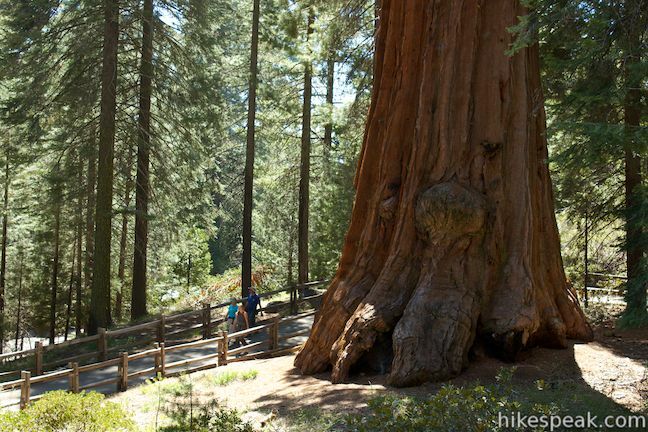 The General Grant Tree Trail splits immediately at the trailhead to start the loop. Take the trail heading uphill to the left, which will curve to the right around the Lincoln Tree, named after President Abraham Lincoln, who relied on General Grant during the Civil War. 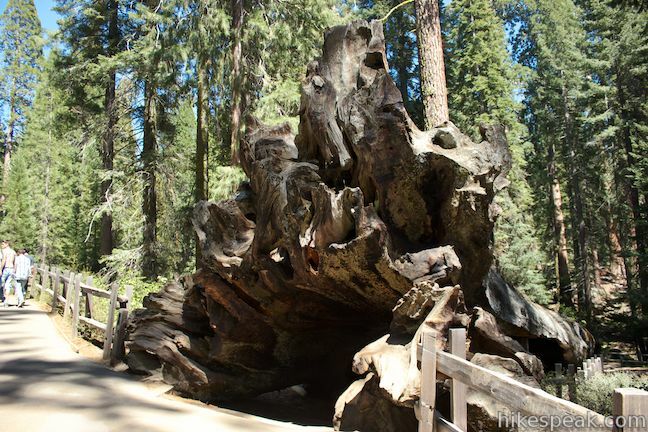 After just a tenth of a mile, you will reach the upturned roots of the Fallen Monarch. 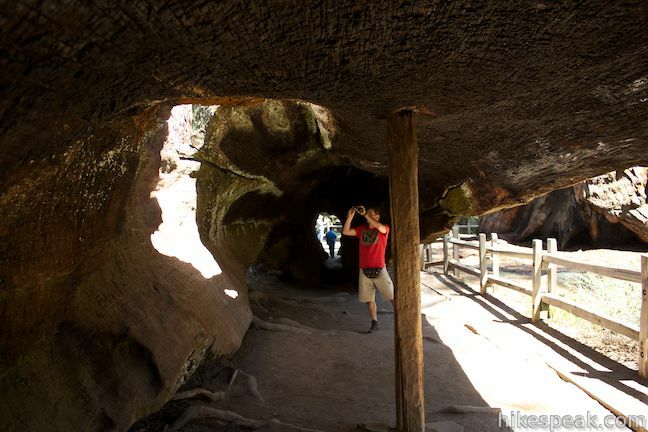 The tree was hallowed by wildfires so that when it fell, it became a tunnel that you can walk through. Turn right and hike down through the Fallen Monarch. In the past, this tree was used as a temporary housing for a pair of loggers, the Gamlin brothers. It was also used as a hotel and saloon, and later as stables for the U.S. Cavalry. 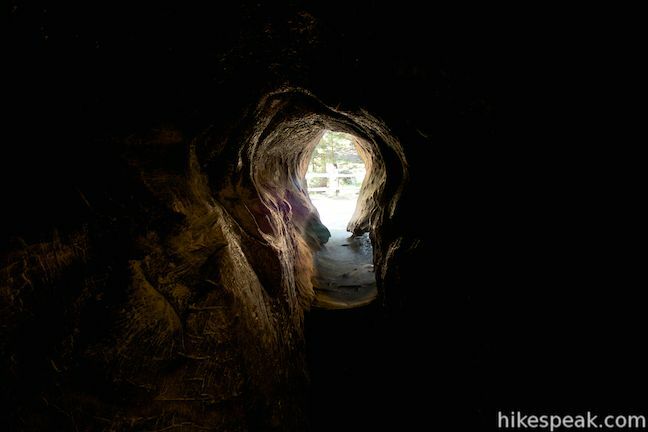 After a couple hundred feet, you will step through the wooden tunnel at the bottom of the Fallen Monarch and reach the lower end of the paved loop. 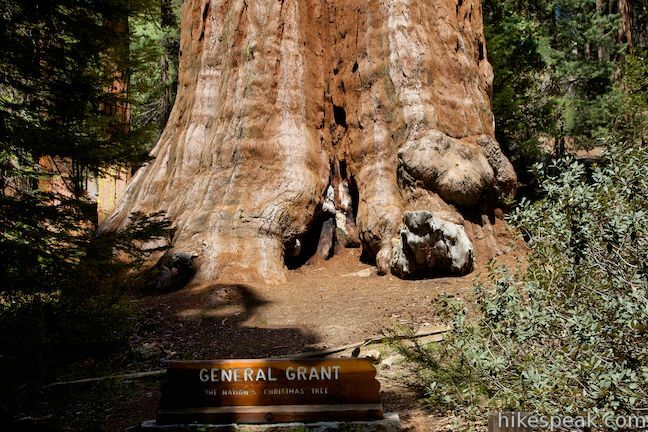 Turn left and proceed toward the General Grant Tree. 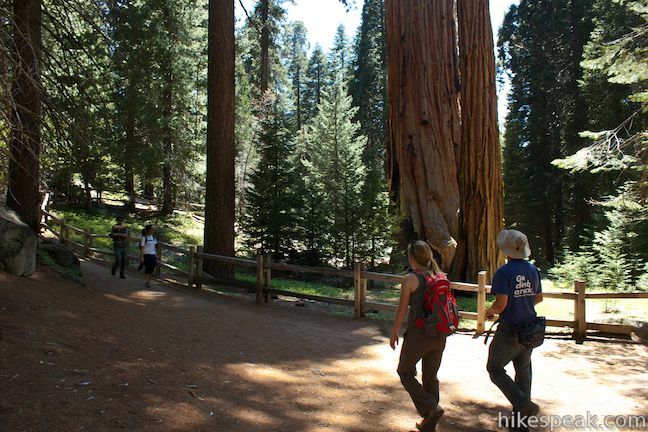 After passing other big sequoias, the trail will curve to the right and you will pass Photo Point. 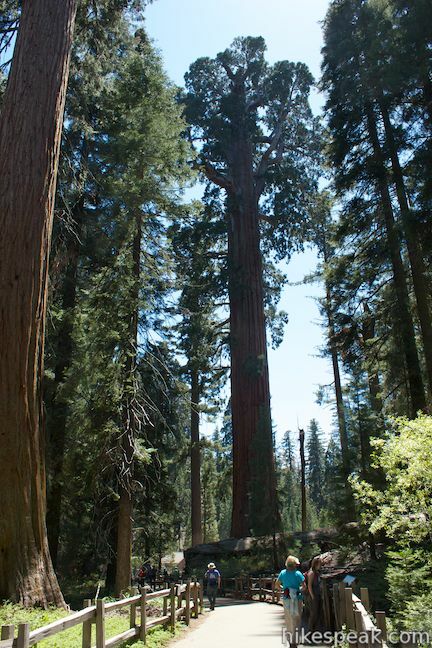 Here there is a good view through the forest toward the General Grant Tree. 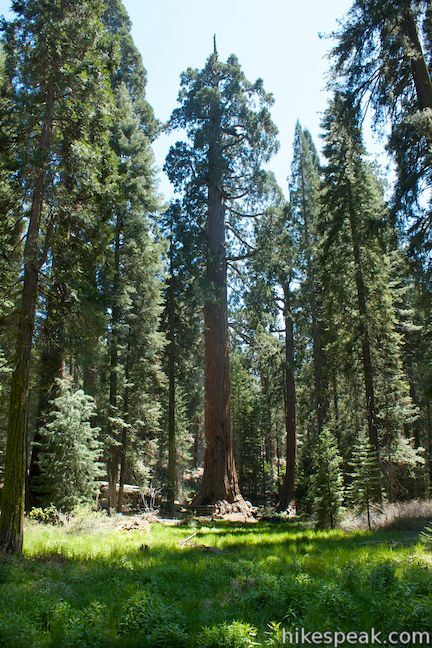 Because sequoias are so tall, once you get up close, it is hard to capture them from top to bottom (or crown to base) all in one photo. 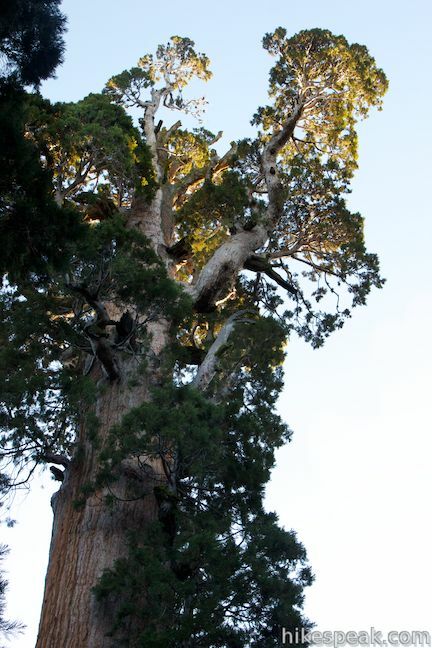 Snap some shots and admire the grandeur of the General Grant Tree. 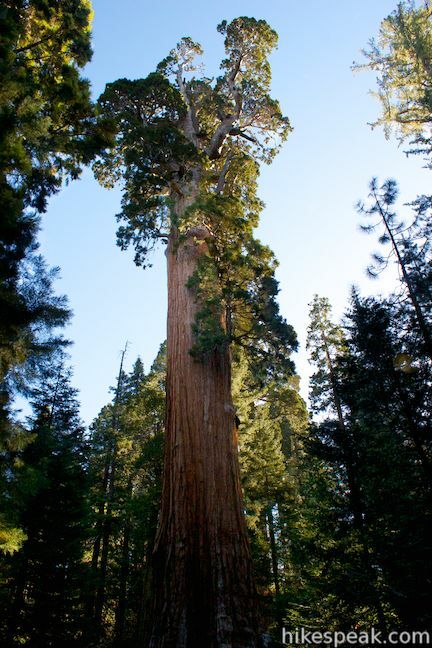 As a point of reference, the lowest branch of the enormous tree is 129 feet off the ground. A tenth of a mile from the Fallen Monarch, you will come to a junction. The trail to the right heads to the Michigan Log and connects to the trail between Grant Village and the Grant Grove Parking Area. 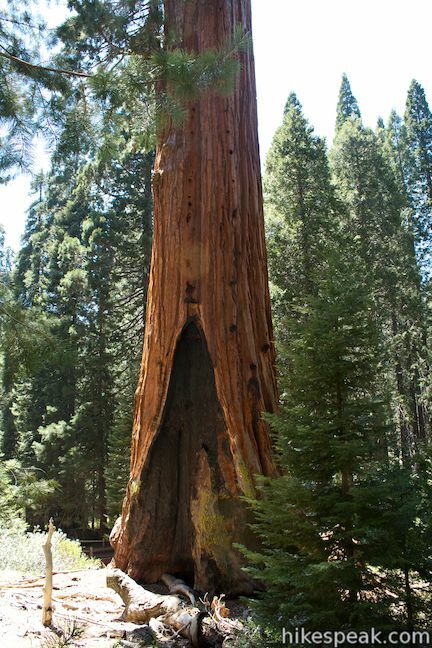 To reach the General Grant Tree, turn left. 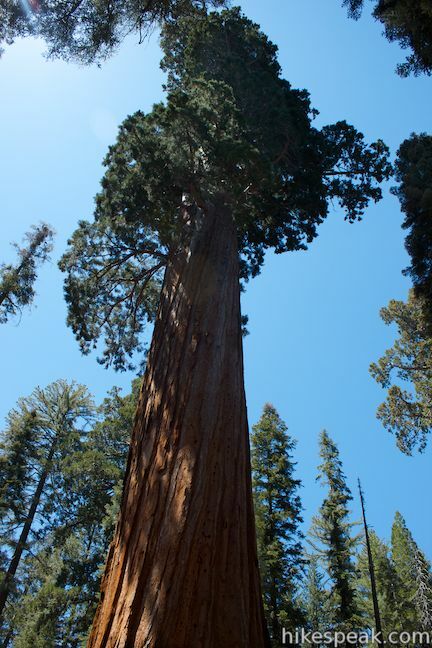 You will quickly pass the Tennessee Tree, one of many trees named after states in the Grant Grove. 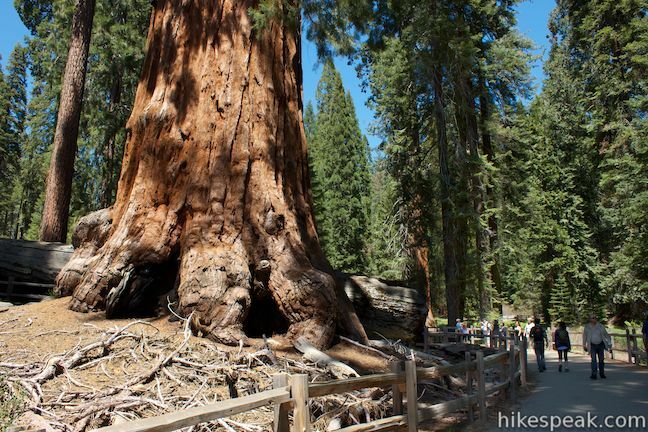 The next split in the trail is for the loop around the General Grant Tree. 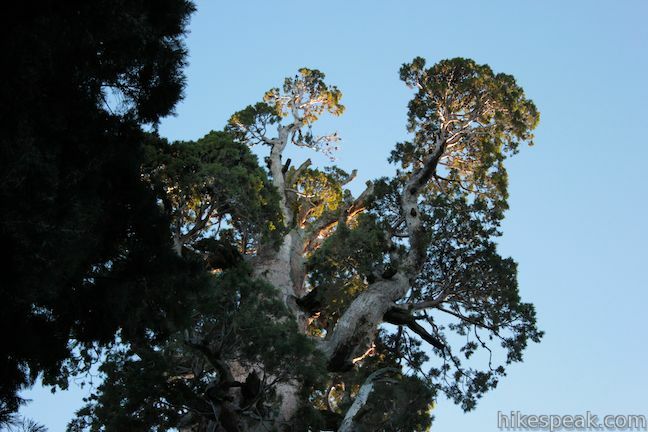 Walk all the way around the awesome tree to truly get a sense of its presence. Informative panels are on the left (west) side of the tree and views of a large fire scar are on the east side. 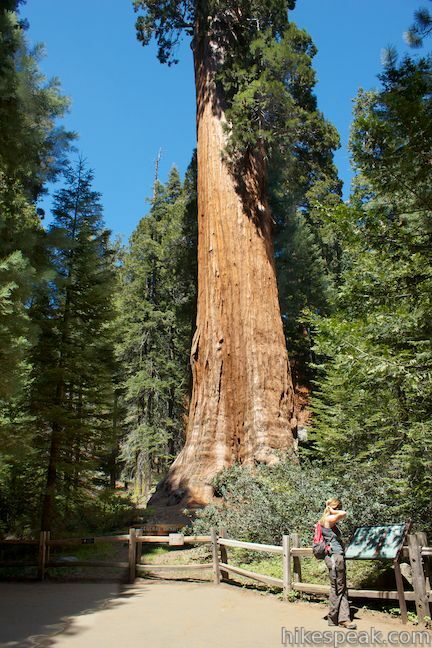 The General Grant Tree has a volume estimated at 46,608 cubic feet, weighs over 1,250 tons, is 267 feet tall (the height of a 24-story building), and has a diameter at base height of 29 feet. 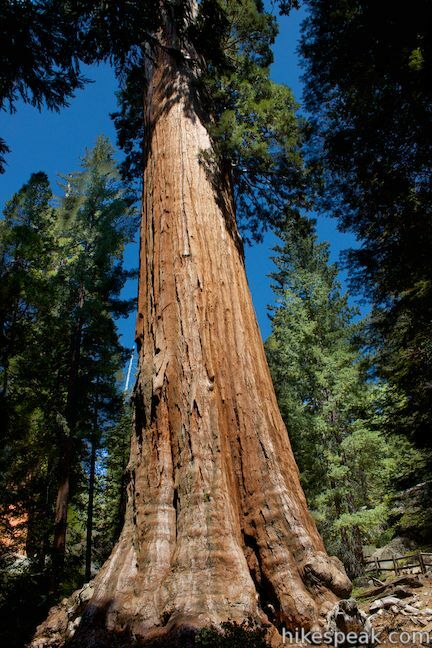 The General Grant Tree is young by sequoia standards at around 1,700 years old and is still growing thicker. 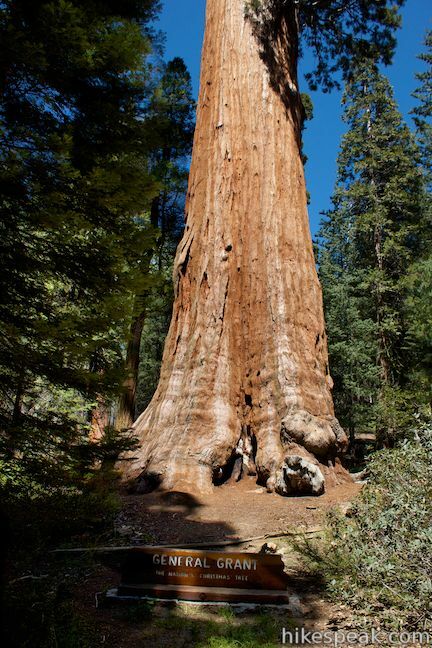 The General Grant Tree is the world’s third largest tree (General Sherman Tree is the largest) with the broadest base diameter of any sequoia at 40.3 feet. 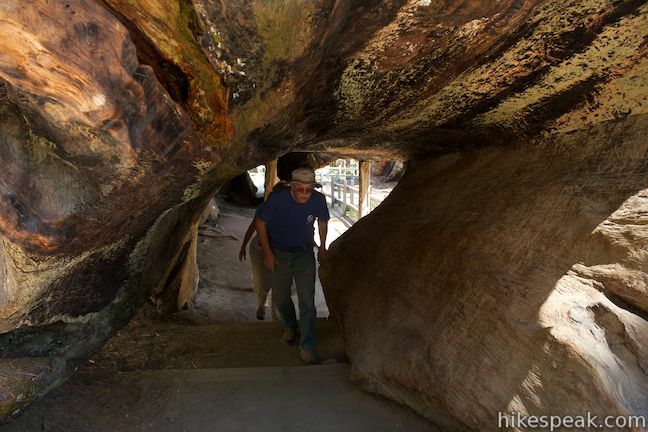 On the east side of the General Grant Tree, a path goes up to the Vermont Log, a big fallen sequoia that broke into pieces (unlike the Fallen Monarch). 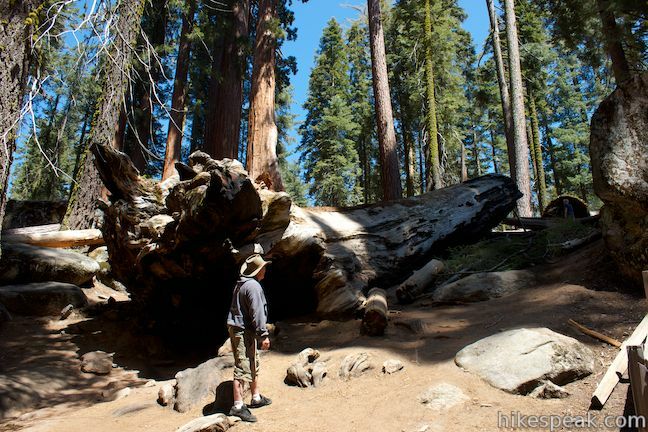 If you hike the North Boundary Trail Loop, you will actually step through higher sections of the same fallen sequoia. 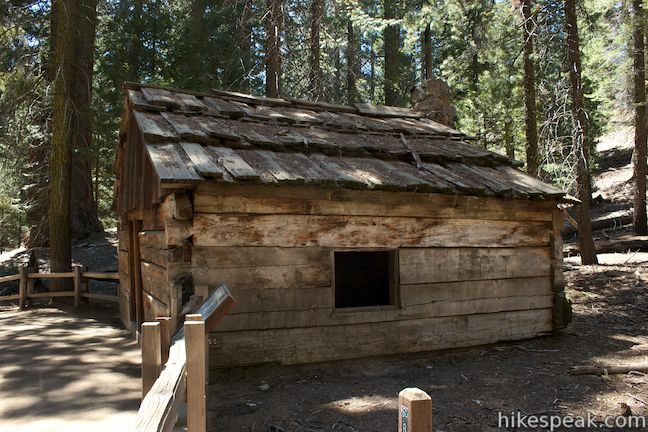 This cabin was built in 1872 by Israel Gamlin, who with his brother Thomas filed a timber claim to 160 acres within the Grant Grove. They quartered here until 1878 while grazing cattle in the mountains. 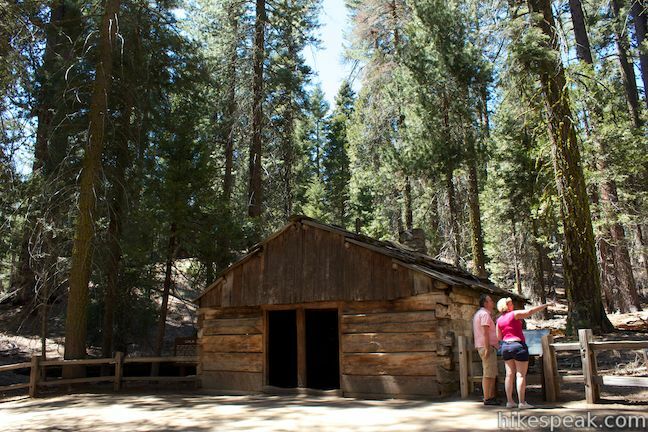 After General Grant National Park was established in 1890, the cabin was used as a storehouse by the U.S. Cavalry who patrolled the park until 1913. 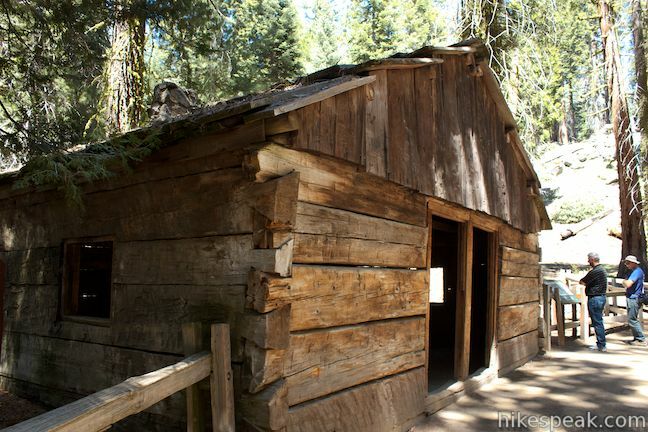 Later it became the quarters of the first park ranger stationed here. There is a junction at the Gamlin Cabin. If you turn right, you can take a dirt trail up to the North Boundary Trail Loop. 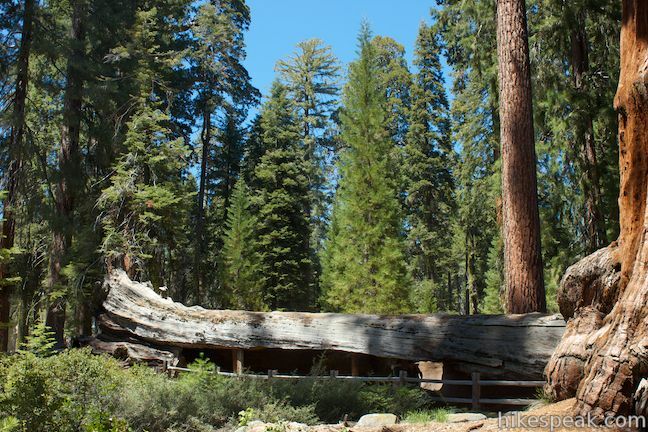 Even if you do not hike the full loop, you could walk a short distance to North Grant View for a look down over the cabin toward the General Grant Tree. This tree was cut in 1875, and a 16-foot section was sent to the Philadelphia Centennial Exhibition of 1876. Only the outer shell was exhibited, the parts being reassembled after shipment. 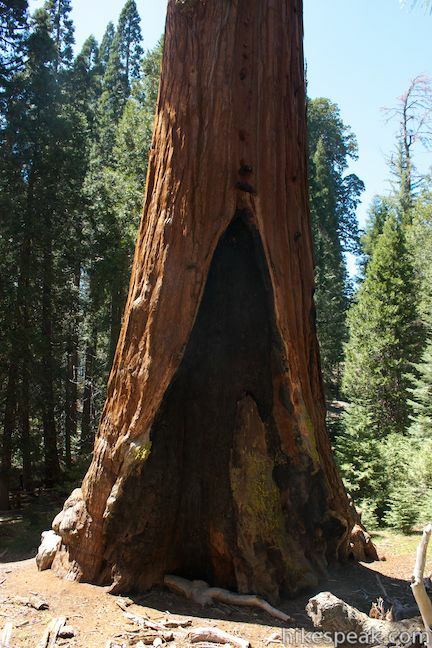 Eastern people refused to accept the exhibit as part of a single tree and called it a “California Hoax.” It took two men nine days to chop down the tree. 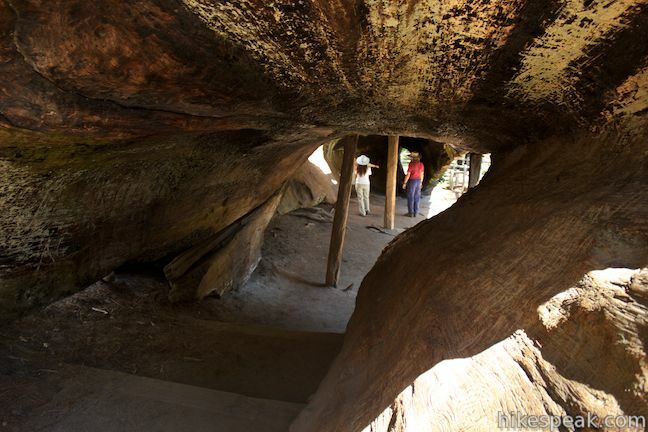 Its upper trunk is the scarred log down slope from the Grant Tree. Ladies from a nearby logging camp used to conduct Sunday school services for their children upon the stump. 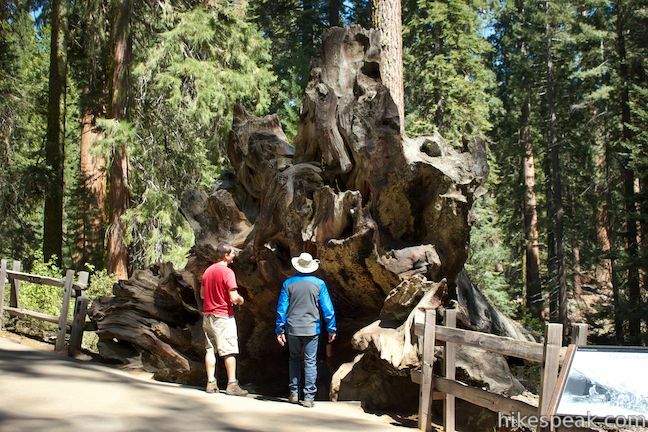 While the “California Hoax” was a sad finish for the 1,800-year old tree, it would only be 14 more years before the grove received permanent federal preservation as a national park. 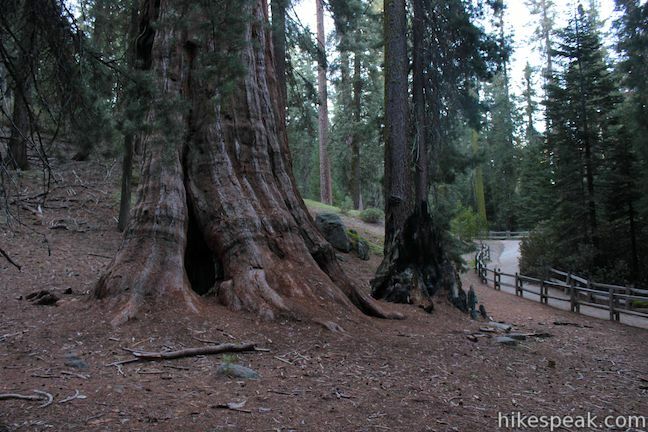 The California Tree will come next on the south (left) side of the trail, and while the Lighting Tree may not have actually been struck by lightning, the California Tree definitely was in 1967. When a bolt of lighting hit it, the top of the tree shattered and went up in flames. 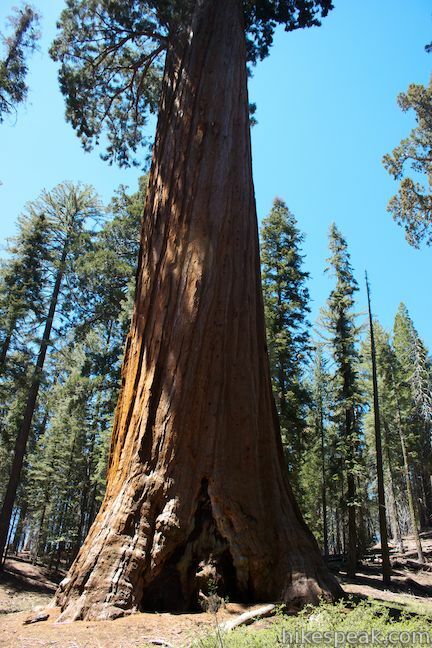 For the safety of park visitors, the tree was extinguished, a procedure that required a forester to climb up into the tree with a hose. When you get back to the Fallen Monarch, turn left and walk back down through the tree again for double the fun. At the other end, turn right this time and hike 0.05 miles down to the trailhead. 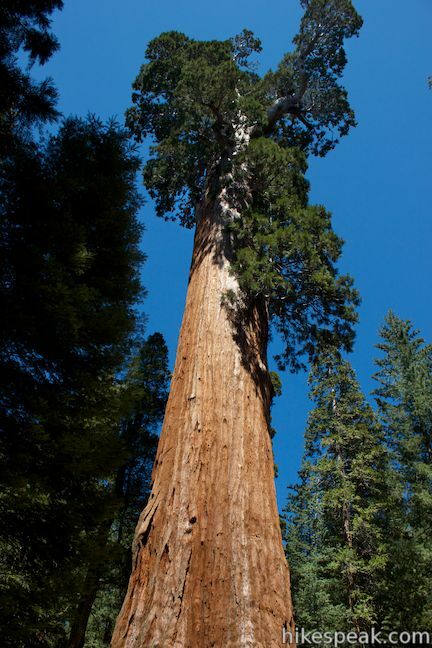 You will pass the Robert E. Lee Tree, named after General Grant’s Civil War adversary. 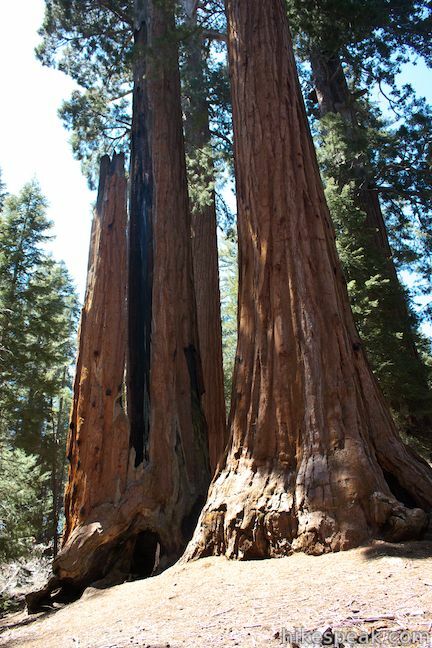 Across from the trailhead, you will spot a cozy pair of sequoias named the Twin Sisters that joined together at their bases. 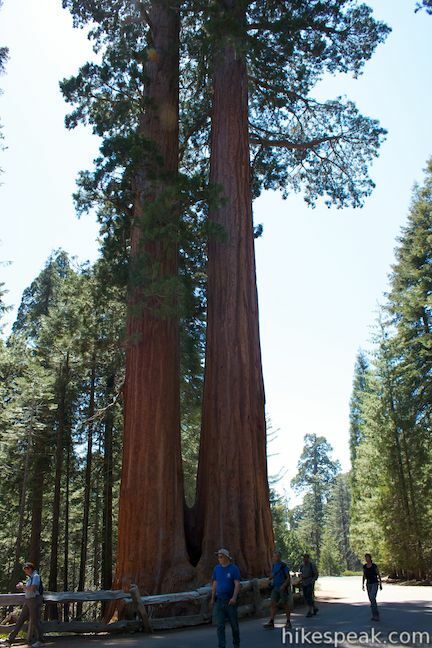 Double trees like these can be found in most sequoia groves. 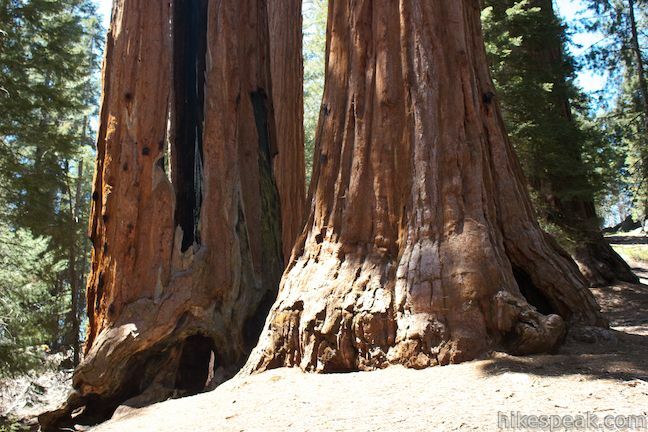 The trees are so big that when they started growing they were at least ten feet apart and only teamed up after decades or centuries of growth. 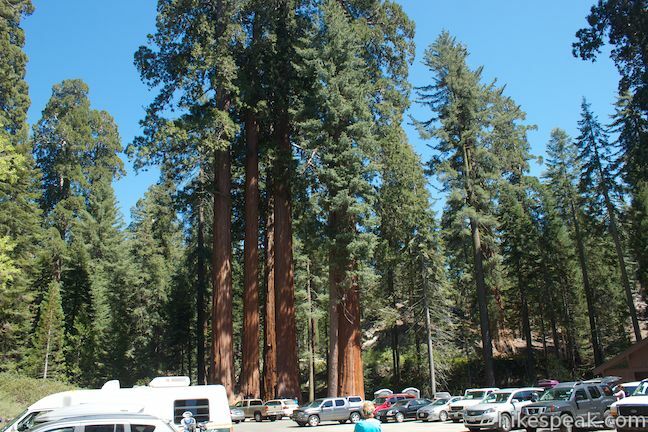 At the far end of the large parking area, you’ll spot another cluster of fused together trees named the Happy Family. 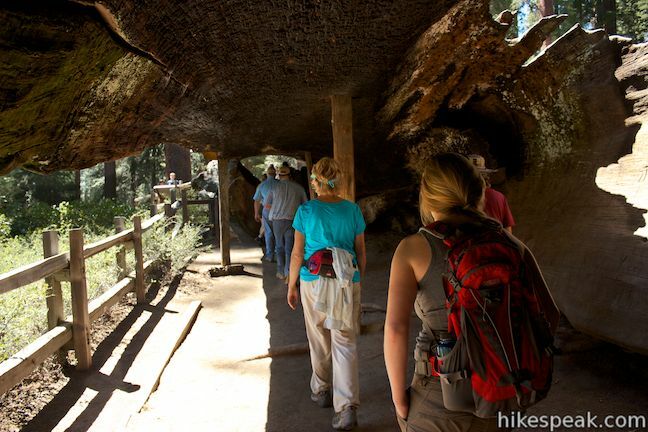 Hopefully you and your family will be happy after hiking the General Grant Tree Trail. 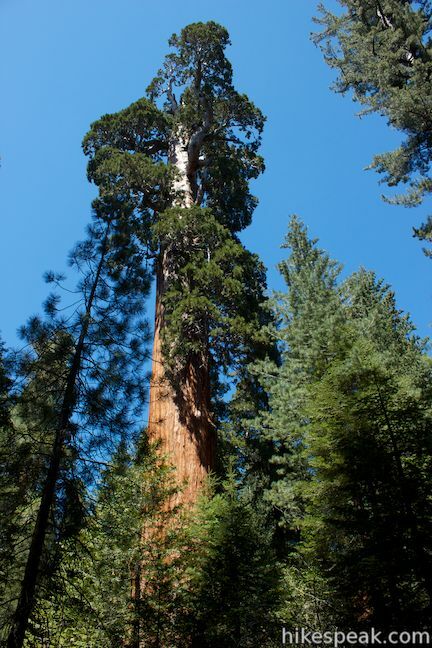 Please help to preserve the Grant Grove by not walking on or marring any trees. 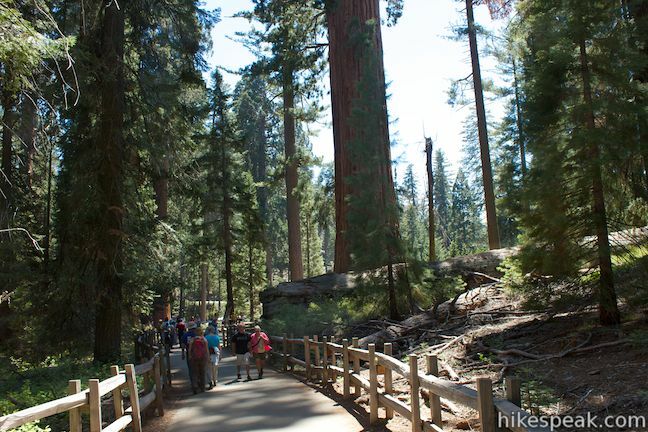 This is a very crowded and noisy trail, so arrive in the early morning if you would like to experience some fleeting tranquility in the gorgeous grove. 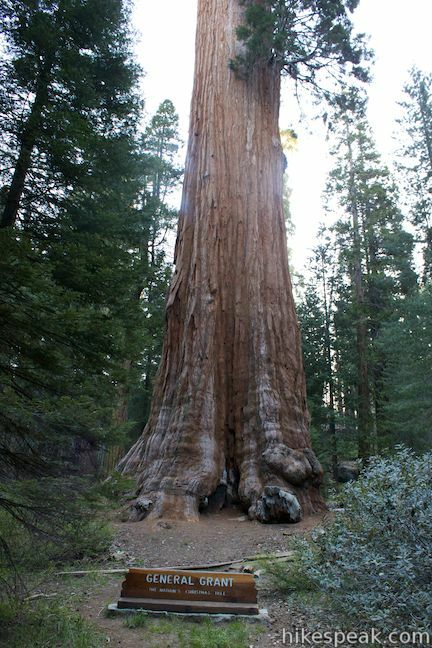 It is quite a sight when the first rays of sunlight strike the top of the General Grant Tree before spreading down to illuminate the rest of the grove. 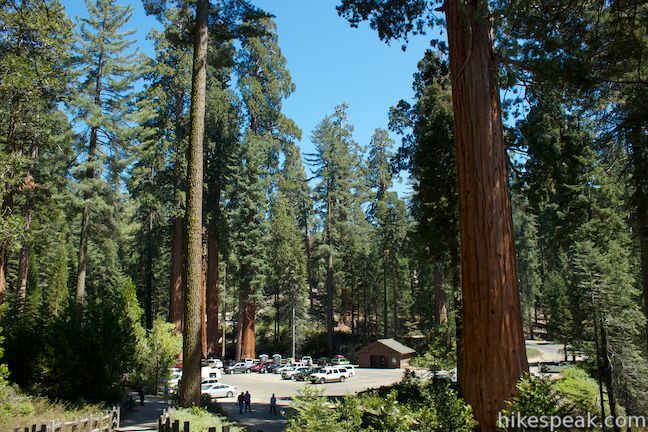 Dogs and mountain bikes are prohibited on trails in Kings Canyon National Park. 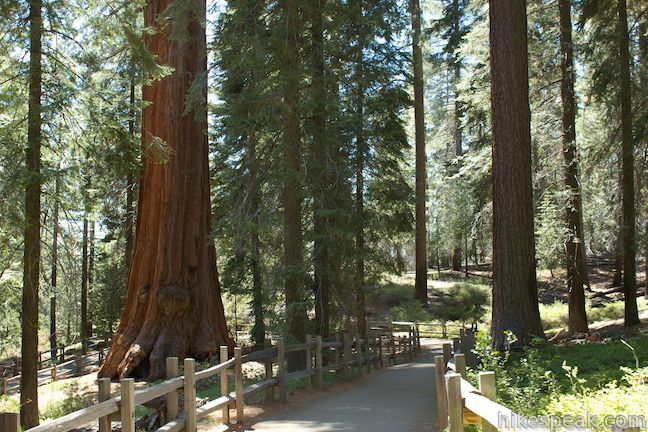 A national park entrance fee is required to visit the park, but you will not need a permit to hike through the Grant Grove, so get out and enjoy! 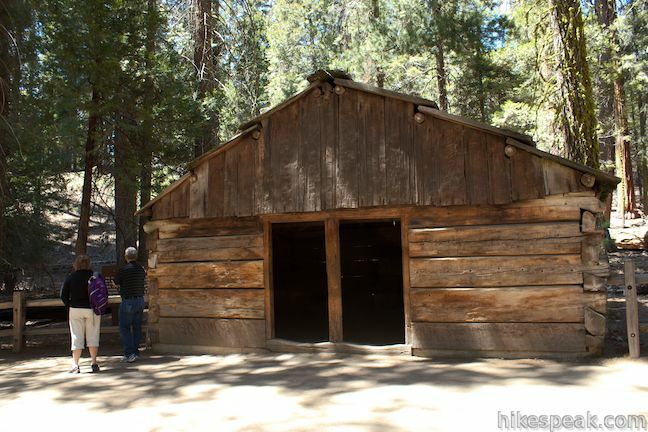 To get to the trailhead: From Fresno, drive east on Route 180. 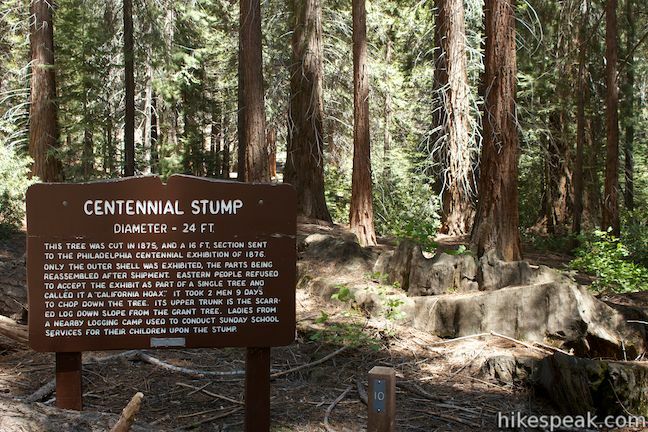 After some 50 miles, you will reach the Big Stump Entrance Station for Kings Canyon National Park. Proceed 1.7 miles to a three-way intersection. To the right, Route 198 heads south toward Sequoia National Park. Turn left to stay on Route 180 and drive another 1.6 miles north to an intersection with Grant Tree Road. Turn left down Grant Tree Road, which will be on the left, 0.2 miles after the Grant Village, which will be on the right. After turning left on Grant Tree Road, you will pass the entrance to Azalea Campground on the left and proceed 0.75 miles down to the Grant Grove Parking Area, which you will find below a right bend at the bottom of the road. 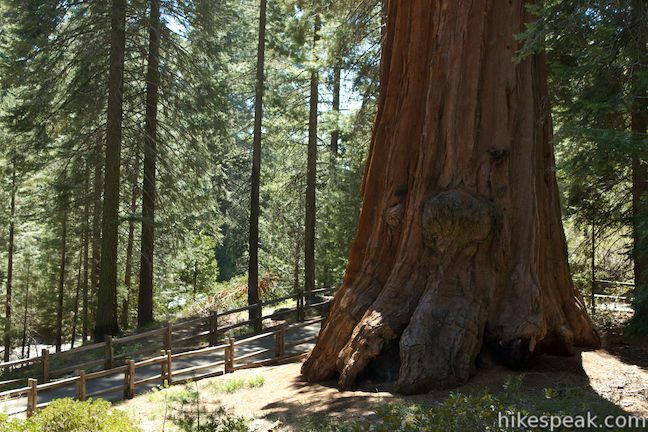 General Grant Tree Trail begins from the northwest side of the lot near the Twin Sisters. 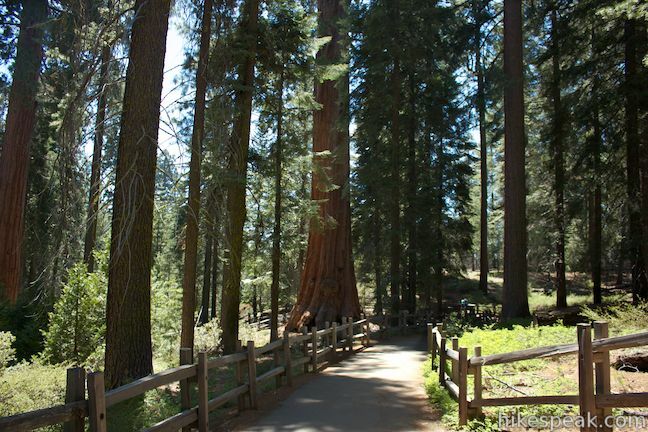 This mile-long trail connects the visitor center at Grant Village with the parking lot at Grant Grove, passing through Azalea Campground to reach giant sequoias, including the General Grant Tree. 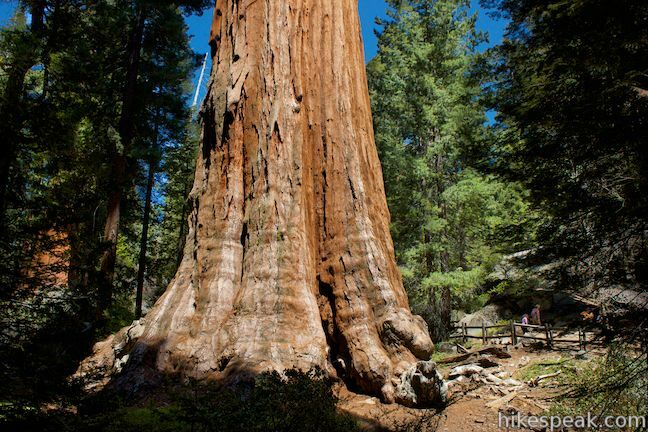 Was there ever a N.Y. Tree in Grants grove? Can you ride bicycle on the hiking trails?